Matt C: Now we're in December, and thinking of the costs involved in the annual Yuletide madness, I had hoped my pull-list would settle down a bit, to allow me to, well, you know, buy Christmas presents for the kids and such. But oh no. It's yet another busy week of comics for me and another Wednesday of wondering how much longer my bank account can sustain the hefty outgoings! But such is the life of the rabid comic book fan. So this week, my pile begins with a new Marvel #1 (been a few of those recently), Daredevil #1. Charles Soule, a practising attorney, takes up writing duties for perhaps comicdom's most famous attorney, Matthew Murdock (after doing an excellent job recently with another superpowered lawyer, Jennifer Walters, aka She-Hulk). I have high hopes for this one. Talking of real life careers providing the basis for storytelling, Sheriff Of Babylon #1 from Vertigo has former CIA operations officer Tom King telling a tale set in Baghdad in 2003, and it looks very promising indeed. King also writes another book on the list this week, Vision #2, and after the unexpectedly brilliant debut issue (the best of 'All New, All Different Marvel'?) he's now firmly on the list of 'Writers To Watch'. An indie release that caught my attention in Previews is Carver: A Paris Story #1, which will see some adventures featuring 'globe trotting and notorious gentleman of fortune Francis Carver'. They had me at 'notorious gentleman of fortune'! Oh, and just to clarify my earlier comment: yes, my kids will be getting presents this Christmas. I said that for effect - honest! Stewart R: With Thanksgiving whizzing past and Christmas firmly in their sights Marvel will be eyeing the next handful of Wednesdays as the prime time to get as many of their new #1s out as they can before the inevitable lull between Christmas and New Year. 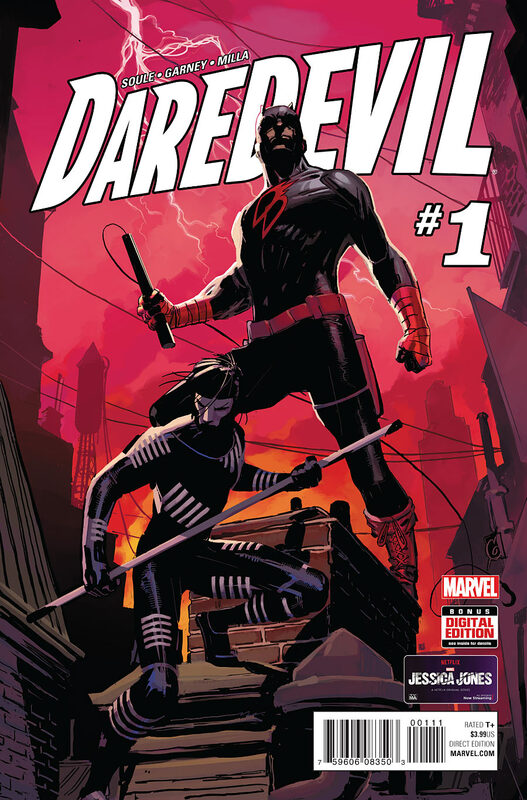 Top of my list has to be Daredevil #1 thanks to Charles Soule picking up from where Mark Waid (and... sigh... Secret Wars) have left us, but it's not so much the acrobatic antics that have me excited, but more the legal entanglements of Matt Murdoch's day to day life. Soule's other career as a qualified lawyer saw him inject some interesting court politics into his run on She-Hulk and I'm really looking forward to seeing what he brings here with Murdock swapping roles from defence attorney to a representative of the prosecution! Soule of course has me reading his Inhuman's work with Uncanny impressing so far, and this week sees that workload doubled (although he's sharing writing credits with James Asmus) with All New Inhumans #1. Now, having read the X-Men books around the adjectiveless title's 200th issue, this premise of Inhumans rushing around the globe, interacting and saving new 'Nuhumans' sounds exactly like the year following on from the 'Messiah Complex' storyline so I'm going in here a little sceptical and will see what develops. At the very least this will be the one Marvel title deserving of the 'All New' moniker as it will be dealing with a slew of new characters as they transform and their powers manifest! If it proves to be a close copy of that X-Men run however - unlikely to be an intentional nod - I will probably bailout early and stick to one Terrigen-infused book. Elsewhere I shall be looking at Mystery Girl #1 by Paul Tobin and Alberto Albuquerque, following an intriguing browse through the preview today which really got its hooks into me and I will definitely be picking up Unfollow #2 to see where Rob Williams takes his social media thriller after a promising start.